This is an executive summary of the report Equal Treatment? 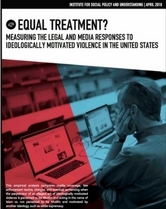 : Measuring the Legal and Media Responses to Ideologically Motivated Violence in the United States. Insert your information to download the executive summary.